Just a quick little post involving my favorite ingredient : COCONUT! I love macaroons and never feel (too) guilty for eating them. I dipped these in chocolate to make them super awesome. Om Nom NOM says the Coconut Monster. In a steel mixing bowl, whip egg whites and salt with a hand blender or whisk (quickly) until smooth and soft peaks form. Add honey and vanilla. Whip some more until stiff peaks form. Drop about 2 tablespoons of the batter onto the sheet, pinching the mounds at the top. Bake for about 15 mins until they turn a golden brown on the top. While baking, melt chocolate in a double boiler and stir until smooth. 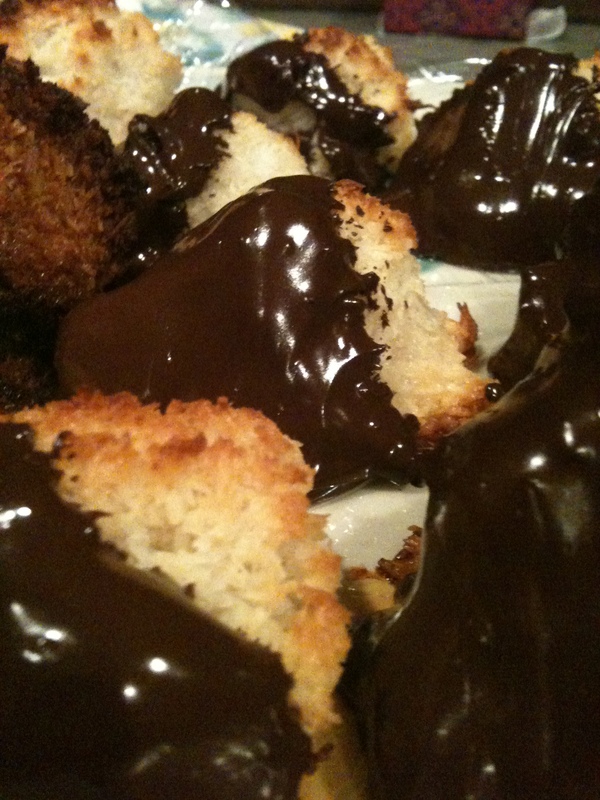 Once macaroons are cool, dip into chocolate halfway and let cool in the fridge for 1-2 hours.